Sea, Sand & Sky: The Adventures Continue! Hello again, readers! Welcome to week three! We have had an adventurous week, yet again! 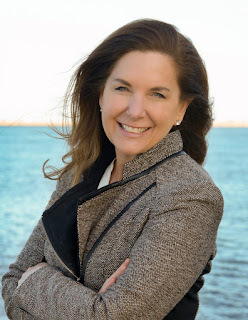 Monday, I attended our first Share the Harbor cruise to Georges Island. Our Share the Harbor cruises are free boat rides that we provide to the general public to either Georges or Spectacle Island. It's a great way to allow local Bostonians an opportunity to get out on the water and visit one of Boston's islands. With a couple pirates on board, we set off to Georges with a group of about three hundred or so visitors! It was great to see so many families, some even just visiting the area, come explore Fort Warren with us. JPAs had a blast fishing and playing sports with the kiddos, and the weather was great. 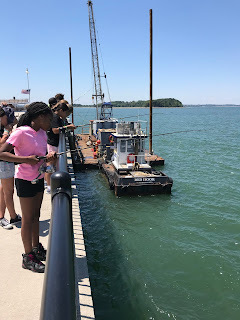 Tuesday, the AABH team was extremely excited to start our first trip to Spectacle Island; however, the trip was canceled last minute due to the pending storm and flash floods... Instead, we spent the morning fishing, chalking, and coloring with a group of kids, who unfortunately hadn't gotten the memo that the Spectacle trip was canceled. As we fished next to the Blue Hills Pavilion, a kid caught an eel! We were thrilled!! Unfortunately, it escaped, but we were all so excited to catch our first non-crab animal this summer! On All Access, we rarely catch anything but crabs, so this was big news for us! Wednesday and Thursday, we finally made it to Spectacle Island. Both days were gorgeous, and we were able to fish and play sports with large groups of kids. On Thursday, we had one of our largest groups yet--close to 630 people! Spectacle is great because you can swim along the beach, whereas Georges doesn't allow swimming. Both days, we would wrap up the trip by dunking into the chilly water before boarding the P-Town II back to Boston. Unfortunately, on Thursday, our crab trap got caught in the pier, so we had to leave it there over the weekend. Hopefully, we can retrieve it on Monday! 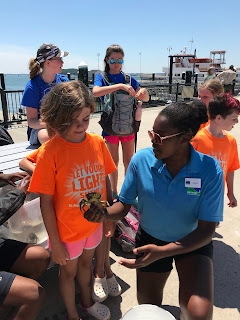 Imani showing a camper a green crab! 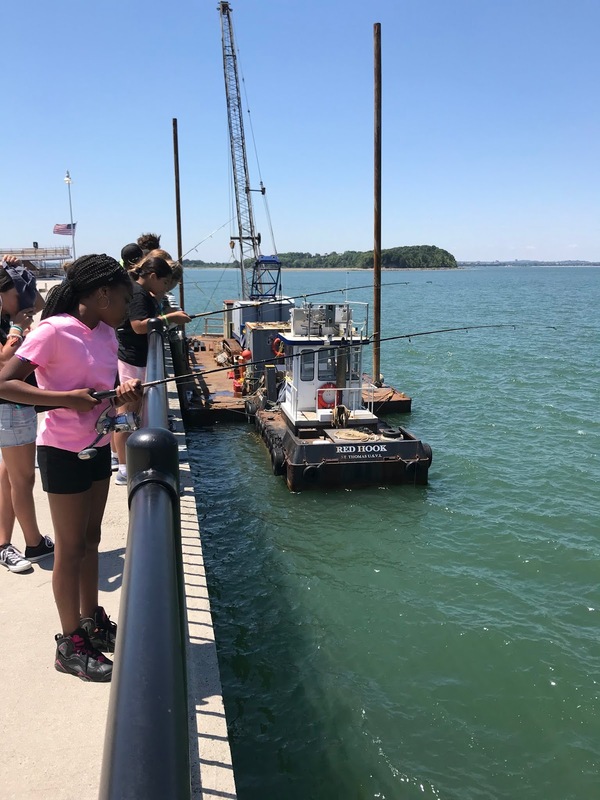 Friday, we headed over to Atlantic Wharf--right next to the Children's Museum, where we held a series of activities for a couple groups of kids: fishing, pirate storytelling, exploring a touch tank, and fish printing. Right next door, Deonte's group at Children's caught a striped bass, so we borrowed it for our touch tank--which was pretty neat! The kids were amazed at the bass, crabs, and moon jelly that we had caught. Finally, we ended the day with burritos from Boloco! All in all, it was a great week! I'm hoping that the weather next week remains sunny and cool.